Note: Each book has its own web page with information about what’s in it, and its blurbs, reviews, and media. Click on the link to get to that page. For information and preorders, click here. Order from Oxford University Press or Amazon. For more information, blurbs, reviews, and media click here. What’s wrong with the US food system? Why is half the world starving while the other half battles obesity? Who decides our food issues, and why can’t we do better with labeling, safety, or school food? 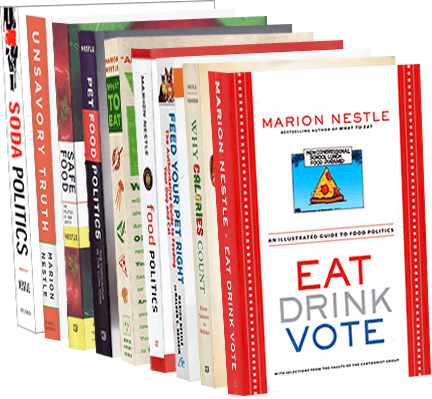 In Eat, Drink, Vote, Nestle teams up with The Cartoonist Group syndicate to present more than 250 of her favorite cartoons on issues ranging from dietary advice to genetic engineering to childhood obesity. While encouraging readers to vote with their forks for healthier diets, this book insists that it’s also necessary to vote with votes to make it easier for everyone to make healthier dietary choices. Calories—too few or too many—are the source of health problems affecting billions of people in today’s globalized world. In Why Calories Count, Marion Nestle and Malden Nesheim explain in clear and accessible language what calories are and how they work, both biologically and politically. The authors offer candid advice: Get organized. Eat less. Eat better. Move more. Get political. Pre-order from your local independent bookstore or University of California Press or Barnes and Noble, or Amazon.com. Order from your local independent bookstore or Amazon or Free Press/Simon and Schuster or Barnes & Noble or IndieBound. Information about the book is on Facebook (click here). Order from your local independent bookstore or Amazon or UC Press. What to Eat (2006, paperback 2007). Order from your local independent bookstore or Amazon or Farrar, Straus & Giroux. Order from your local independent bookstore or Purchase on Amazon or UC Press.